The world of miniature contacts is quite amazing. Pictured above is a special test socket with formed micro contact bumps that are .005 inch (0.127mm) in diameter. There are quite a number of processes used in creating this miniature structure involving photo chemical machining and miniature “bump forming techniques” (for lack of a better word). To give everyone a concept of how small these micro bumps really are, the picture on the left is the actual size (not a thumbnail image) of the test socket. Simply amazing how small things are getting. Many of these types of devices are used in products for the military, aerospace, communications, and a host of other high tech industries. 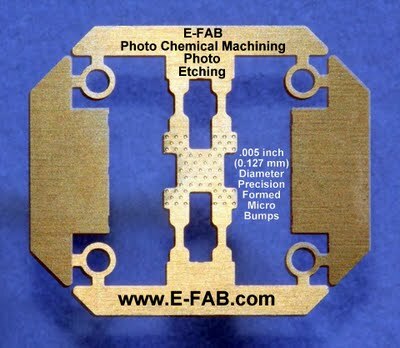 Photos courtesy of E-FAB. Ever see the insides of a cell phone and wonder how it is assembled? How about the small metal battery compartments inside hi-tech toys? Ever taken apart the miniature memory modules that go in digital cameras? These products and others such as keyboards, laptop computers, cordless phones, SIMM cards, PCMCIA card modules, automotive parts, and even the remote controls are assembled with what is known as the heat staking process. When a manufacture wants to join metal-to-metal or plastics-to-metal via small plastic posts that protrude from the plastic housing a heat staking machine is used to apply controlled heat, time, and pressure through a heat staking head. Typically the head is heated up to a controlled temperature. Once heated to the proper temperature depending on the types of metals and plastics being staked, the head makes contact with the protruding plastic posts and are formed into various types of heat staked posts. Staked post types include: Flat, Profile, Dome, Hollow, Cross-Shaped, and Rosette Posts. When an entire plastic side needs to be formed into a plastic lip to hold a metal device, glass lens, or another plastic assembly in place, this process is referred to as side swaging. The heat staking process is found in the following sectors: aerospace, industrial, medical, dental, automotive, semiconductor, electrical, appliance, telecommunications, fixtures, electronics, house-wares, cellular, communications, memory module units, sporting equipment, PCB connector, PDAs, LCD connectors, computers, and more. Just about every type of manufacturing industry uses some form of heat staking to assemble their products. The equipment used for heat staking comes in a wide variety of types and styles. The heat stake machines are sometimes referred to as thermal presses. Many of these thermal press machines are custom made to accommodate various product sizes and product lines. Tooling can be custom designed to allow for various manufactured parts to be assembled via heat staking from one machine. Simply remove one tooling setup and interchange it with another. Ultrasonics is also another form of product assembly, but due to the new tighter tolerance size constraints of the miniature products and the larger size head design requirements for ultrasonics to function properly, and typically a slower throughput with ultrasonic assembly equipment, more manufactures are heading to the heat staking machines route for their mass production parts and products assemblies. A key advantage is that heat staking heads (the portion of the equipment that makes contact with the plastic piece) can be designed to incorporate very small multi-point contacts to speed up the mass production assembly process. In essence, you can have a dozen or more contacts all making contact at the same time on a very small assembly component, and quickly stake the entire assembly all in one cycle. The same machines used for heat staking can also be used for the heat sealing process. For example, when LCD display units need to be applied to a circuit board assembly, a special conductive heat activated glue-like adhesive is activated with a heat press machine. For an example of how a heat staking and heat sealing machine and head function for a cell phone or memory module see YouTube for heat staking and heat sealing videos. The heat staking process is known for its outstanding repeatability in the mass production environment. Heat staked joints in the miniature world of plastics assembly can withstand the rigors of vibration of heavy daily use of the assembled products. The process is also known for the mega machines that are involved in the large format automotive sector. Dashboard covers, door panels, and even the dashboard assemblies themselves are assembled with these mega heat staking machines. No doubt about it, we live in a mass production heat staked world. Professional Web Services, Inc. provides all facets of Internet marketing services, online advertising strategies, website branding solutions today, to provide more sales for your business tomorrow. Get business services, strategies, and solutions for your company now.